Ecove ran a design competition in which four Australian architects were invited to create a building for the site. Bates Smart’s winning design features a curvaceous, triangular-shaped building with green walls of living plants embedded into the façade, and elevated communal courtyards every five levels. A cascading water feature is one of many focal points of the site, which will also have a childcare centre. Opal Tower will join Ecove’s Australian Towers, AT11 and One Australia Avenue developments along Australia Avenue. 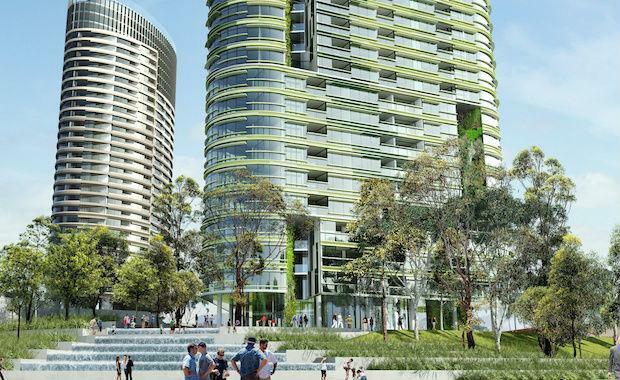 The development will create a gateway between Sydney Olympic Park and Bicentennial Park via a new landscaped bridge over Bennelong Parkway and a pedestrian tunnel under the existing railway line. Opal Tower will comprise a high proportion of large four-bedroom apartments. The super-sized apartments will be on the upper levels and around 160 square metres internally. They are aimed squarely at people wanting a home-sized penthouse. “Scaled-up apartments are a perfect alternative to the family home, and we could have done with more of them in our earlier buildings,” said Sue Ballesty, Marketing Director of Ecove. The residential population of Sydney Olympic Park will swell to around 5,000 within the next few years, and is forecast to reach 14,000 by 2030. Marketing for Opal Tower will commence in late 2014.